SnoreRX is an effective device to reduce your snoring problems. It worked for my husband, and I think you’ll benefit too. To treat my husband’s snoring, our doctor recommended that he immediately make drastic changes in his lifestyle – ceasing alcohol-intake was top of the order, alongwith yoga exercises and throat exercises. He also recommended sleeping on side for my husband. This was tough to implement because Casey loves to sleep on back, and has always been a back sleeper. I stuffed tennis balls and whatnot in his shirt to keep him on his side through the night! But what helped Casey best was SnoreRX. So let’s have a look at SnoreRx and what it can do. Who is SnoreRx Snoring Aid good for? Who should not use SnoreRx Snoring Aid? How is SnoreRx different from other Snoring Aids? This product possesses high quality and practicality. Just to be fair, let me point out its positives and negatives. These can help you see the device’s potentials so you can decide wisely. I’ve listed down its pros and cons below. SnoreRX has been proven to help lower snoring problems over time. I can attest that using this device rather than getting surgery is more practical, viable, and painless. The device is comfortable because it is customizable. It is easily adjustable, especially when you feel a little discomfort. The procedure only takes a few minutes. SnoreRX can be adjusted in increments of just about a millimeter for your advantage and comfort. It can always be reset anytime you like for as long as you think you are not comfortable or it is not attaining the best results. To get into the ‘boil and bite’ process of setting up, simply boil a cup of water in the microwave. Put SnoreRX into it for 90 seconds, then transfer to another cup of room-temperature water for about 3 seconds. Upon removal from the cup of water, firmly bite into the oral device so as to create your dental impression. By then, the device is ready to be used. There are special medical or dental conditions that may prevent this device from trimming down your snoring problem. Meanwhile, Mayo Clinic identified possible side effects like excessive salivation, jaw pain, facial discomfort, and dry mouth. One thing that I don’t like about buying and using SnoreRX is that Medicare and other health insurance do not cover this condition. Most insurers do not consider snoring as a pressing medical issue (something our healthcare bill makers should seriously consider). SnoreRX is a mandibular advancement device (MAD) that is designed for people like us, who are suffering from obstructive sleep apnea wherein implants and surgical procedures are not yet urgently required. It’s easy to operate and works by manually advancing your lower jaw forward as we sleep. The idea is to open our airways while we are asleep, to improve breathing and prevent unnecessary obstruction in air passage during our critical unconscious state. But it is imperative to seek advice from your dentist if you decide to try it for yourself. A regular visit of every 6 months during the first year of use, and at least once every year thereafter is recommended, too. Before using SnoreRX or other similar devices, it is best to first consult with a doctor or a dentist. Although I can personally attest that the mouthpiece is a proven effective tool to help curb unnecessary snoring while sleeping, there is also a risk involved, specifically for those who are suffering from a condition called temporomandibular disorder (TMD). According to Web MD and the National Health Service-UK , this disorder affects the muscles in the joints (between your lower jaw and your skull base) that are practically used for chewing. Though TMD is not usually severe or serious, its symptoms can bring about pain, cause jaw joint popping or clicking, and/or lead to difficulty in eating or even talking. It affects about 30% of adults and its manifestations may last a few months before total recovery is achieved. Needless to say, SnoreRX and similar devices can possibly make the pain brought about by TMD worse. This is because when the mouthpiece is in use, the jaw is forced forward, which can lead to shifting of position of tooth and to added pressure to the muscles in jaw joints. In some cases, the discomfort of using MAD mouthpieces last several days even after a person quits using it. Take note that SnoreRX is not and should not be used as treatment to sleep apnea. It only controls or regulates breathing to lower obstruction and snoring. The best option is to regularly consult your doctor for proper monitoring and management of the condition. Likewise, it should not be used by people who wear dentures or tooth bridges, those who wear braces or retainers, or those who have had teeth implants in the last 12 months for the obvious reason that SnoreRX and other MAD mouthpieces require stable teeth to hold on to. Imagine my relief when I didn’t have to worry that! There are three core features to look for when considering the use of any anti-snore device—medical standards compliance, custom impression, and adjustability. SnoreRX has all these! For compliance to medical standards, The American Academy of Dental Sleep Medicine declares SnoreRX as safe and effective for decreasing snoring incidences. It is even recognized and cleared by the US Food and Drug Administration as a device for reducing snoring. The agency also pointed out that SnoreRX is made of reliable and safe components that are at the same time hypoallergenic. Because of its customizable impression, maximum comfort is ensured. The device can facilitate full and comfortable breathing as you fall deep into sleep through its open front that allows full airflow, thanks to its V-Flow design. We never need to worry about any obstruction to our breathing. SnoreRX is a product designed and manufactured in the US, where there are stringent policies about medical or dental devices. We are assured that the authorities have carefully and thoroughly checked the instrument for overall safety and effectiveness before those got the go-signal to be distributed in the market. Also take as an assurance that SnoreRX’s design and built uses thermal matrix materials that facilitate personalization through its custom impression feature. This way, we know that the device we are using is best customized for our own use. We can even make adjustments up to five times during the total lifespan of the device of more than six months to about two years. How is ZQuiet Snoring Aid different? SnoreRX is different from all similar devices in the market because aside from the three main and basic features described above, it also comes with other advanced factors. First, its design does not use screws, rods, springs, and rubber bands that may drop anytime and cause an awkward medical emergency. Second, it ensures maximum flow of oxygen into the air passage while you sleep, thanks to its open front. The micro-fit feature gives way for precise calibration of fit for overall comfort of user. Calibrator is easy to read and provides clearer gauge of the jaw adjustment for the device. Its posi-lock enables a user to unlock and then reset the new setting anytime. And lastly, its thermal fit provides custom fit through copolymer cushions. Based on the internal audit review from internal audit review from 2012 to 2015 for SnoreRX , more than 90% of the users have reported ideal results. According to them, SnoreRX helped them achieve better sleep, without any unnecessary disturbance that is usually brought about by blocking of airway in the throat. I would definitely agree! Overall, SnoreRX is a highly recommended mandibular advancement device that could help you safely and gradually trim down your snoring problem through opening your airways while you are into deep sleep. It works best when used correctly and with proper guidance from our dentist or doctor. Don’t just take my word for it, give it a try now! Hi guys. Since neither I nor Casey have tried Pure Sleep Snoring Aid, I could not in good faith review this product. However recently my to be co-sister ( Casey’s brother Nike’s fiancee) Julia recently tried Pure Sleep Snoring Aid to help with Nike’s Snoring! Looks like Snoring runs in the family huh! Since Julia was extremely happy with Pure Sleep’s effectiveness, I requested her to review it for all of us here. Pure Sleep Snoring Aid is an effective mouthpiece device to help stop snoring. It helped save my relationship and I’ll tell you how. When my fiance (Nike) and I decided to move in together, I knew I had to make some adjustments. What I didn’t realize was how big of an adjustment it would be. Our first night together, I discovered how loudly he snores. The bedroom resonates with the sound of his snores, and I didn’t get any sleep at all. I tried making him sleep on his side. he would stop snoring for a couple of hours but afterwards, he would start snoring again. That was our pattern over the next several months. I couldn’t sleep properly, so I started sleeping on the couch in the living room. Needless to say, it caused some tension between us until one of my girlfriends told me about Pure Sleep Snoring Aid. When Nike tried it on the first night, it was the most blissful night I’ve had since we moved in together. Let me tell you more about Pure Sleep and what it did for Nike and me. Who is PureSleep Snoring Aid good for? Who should not use PureSleep Snoring Aid? How is PureSleep different from other Snoring Aids? Let me start by showing you the advantages and disadvantages of using Pure Sleep. You can only set its shape once; once it hardens you cannot re-shape it anymore. Comes in two pieces so there are more crevices that can harbor bacteria. Nike did find it annoying to answer the questionnaires before he was allowed to buy the product. I wasn’t sure if PureSleep would be safe. It’s a mandibular repositioning device, and I was worried how it would affect Nike. However, my worries are needless. PureSleep was completely safe to use and did not cause Nike any discomfort at all. The device has air holes that make breathing easy, and it also moves the lower jaw forward to allow air to move without obstruction. Who should not use Zyppah Snoring Aid? Nike was a bit worried because PureSleep requires a prescription, he felt that it might have some adverse side effects, so we consulted with our doctor just to make sure that he can safely use PureSleep. According to our doctor, mandibular devices have always been an effective long-term treatment for snoring and mild-moderate obstructive sleep apnea, and as far as he knows, there are no known complications associated with their use. However, our doctor did tell us that people suffering from central sleep apnea, or were diagnosed with an illness related to temporomandibular joint should not use PureSleep or another mandibular device. To use PureSleep, you should not have dentures, loose teeth, bleeding gums or mouth sores or suffer from any respiratory problems like asthma and emphysema. Since Nike is not suffering from this illness, we asked our physician to give him a prescription. There are four basic elements that make PureSleep Snoring Aid stand out against another similar mandibular repositioning device. It’s easy to use. The device is a two piece set that you can join together using the boil-and-bite technique. This allows you to get a customized fit for your teeth in less than a minute. It has been cleared by US FDA to reduce snoring because the custom mold device holds the jaw slightly forward allowing you to breathe seamlessly while you sleep. It is made in the USA and the materials are sourced in the USA and not overseas. Locally sourced materials give the assurance of quality compared to some unknown overseas brands The device is made of two high-quality plastic types, hard plastic outside and soft plastic inside. PureSleep is co-invented by a dentist and an Ear, Eyes, Nose, and Throat (EENT) specialist. It has been used clinically for over 15 years as a treatment for snoring. I was a bit hesitant to for my man to use the device so I tried to find out more about the product. PureSleep is made in the USA, and using materials sourced in the USA. It is made of resins that are latex-free and biocompatibility-tested. PureSleep has a “try it before you buy it” policy, completely assuring me that they are that confident of the quality and effectiveness of their product. How is PureSleep Snoring Aid different? Nike is very athletic and often goes to the gym to box. When I first saw PureSleep, I thought that it looked like his mouthguard but I couldn’t be more wrong. PureSleep utilizes a patented technology that combines a hard plastic outer shell and soft plastic inside giving it a more sturdy structure. Another thing that makes PureSleep from a regular athletic mouthguard is its design. Puresleep is designed to hold your lower jaw forward to keep the air passage open during sleep, while an athletic mouthguard keeps your mouth closed and covers the entire surface of the teeth. Other than the features I described to you above, PureSleep is biocompatibility tested, its materials have no BPA added, and has the most affordable price compared with similar mandibular repositioning device. Based on Amazon customer review, more than 59% of people who bought PureSleep Snoring Aid said the device worked for them. It helps treat their snoring problem and mild constructive apnea. About 40% of a total number of satisfied customers gave the product a rating of five stars. These people find that the product works and it reduces snoring significantly. I totally agree with them. Before Nike tried PureSleep, his snoring was really bad and it was driving me up the wall. I would often get up in the middle of the night and sleep outside on the couch to get some sleep. This irked him a lot because he likes to cuddle. He hates waking up to find the bedside empty. I didn’t want to leave but if I don’t get any sleep, I won’t be able to go to work. He was a bit hesitant to try the device. He said he’s done every solution possible to cure his snoring. He also mentioned using a similar mandibular repositioning device but it didn’t work. I tried to convince him to try another mandibular device one more time. He probably wouldn’t have agreed if he didn’t love me so much. We visited a physician to get a professional opinion. After he tried PureSleep, I waited for the usual sound to resonate but miraculously, there was none. It was the first night in many weeks that he did not wake up in an empty bed. Now, cuddling up together has become a favorite habit. PureSleep is an effective aid for snoring problems. If you or any of your loved ones have a snoring problem, I highly recommend that you try PureSleep. However, it is still best to consult your doctor before you try anything, but PureSleep is safe to use as a mandibular repositioning device to treat snoring. Zyppah is a revolutionary anti-snoring mouthpiece designed by Dr. Jonathan Greenburg to treat snoring and help patients with sleep apnea. There are four (4) Zyppah versions. There’s one version that can be bought online without prescription and another three that need to be prescribed and custom-fitted by a doctor. Snore No More centers around California currently offer prescription Zyppah. Zyppah spelled backwards stands for “Happy Z” where “Z” stands for zzz or sleeping. This product is committed to stop snoring from the first use and help you improve the quality of your life, and rebuild relationships that might have been affected because of excessive snoring. Who is Zyppah Snoring Aid good for? How is Zyppah different from other Snoring Aids? All products have certain features that make them beneficial and drawbacks that may cause us to have second thoughts on using the product. Here’s a list of a few that would better explain Zyppah as a product to help you with your snoring problems. American-made product, Better Business Bureau (BBB) accredited, and Food and Drug Administration (FDA) cleared. The product was designed by an experienced dentist with background in bioengineering and affiliated with Snore No More facilities in California that specializes in snoring and sleep apnea. Zyppah offers two solutions in one device: jaw repositioning and tongue stabilization to open airways, allow easy breathing, and eliminate snoring. Design is comfortable and easy-to-use: “boil and bite” design ensures a custom fit. It is made from BPA-free thermoplastic material. It comes in attractive neon green and black colors. Zyppah has a 30-day satisfaction guarantee, and free shipping and handling. Like all mouthpieces, Zyppah can cause jaw soreness and drooling for a few days. It is not recommended for individuals with dentures, caps, crowns or loose teeth. Users would need to factor in additional cost for denture-tabs. Although it can be cleaned with only soap and water, it’s suggested to also be cleaned with denture tabs at least once a week. Snoring starts as a nuisance to your relationship with your partner, but it can lead to devastating heartaches in time if not addressed immediately. Zyppah is a solution to prevent this catastrophe! Zyppah is effective for patients who suffer from snoring due to blocked airways. Its design features a two-fold process that both positions the jaw forward and features a unique tongue crossbar that prevents the tongue from falling and blocking the airways while sleeping. These vibrating obstructions are what we normally hear as snoring. With Zyppah, airways are kept clear and snoring is kept at bay, and then completely eliminated! A mouthpiece can be an excellent solution to prevent snoring. But, if you’ve had dental work such as dentures, caps, crowns or loose teeth, you shouldn’t use Zyppah. To be effective, strong upper and lower teeth are a necessity to use the device. Teeth issues can prevent the device from being held firmly in place and cause it to not work effectively. Also, Zyppah doesn’t address all causes of snoring. It is still recommended that you see a specialist to help you find an effective solution based on your specific diagnosis. Zyppah is classified as a MAD or mandibular advancement device. MADs are devices also referred to as oral appliances that work by moving the mandible or the lower jaw forward and open the airways. Like other MADs, Zyppah does the same lower jaw positioning action to open the airways. However, Zyppah also functions as a TRD or a tongue retaining device with the rubber-like stabilizer strap at the end of the mouthpiece. Once you fall asleep, the tongue flops toward the throat because the muscles relax. When this happens, the uvula and soft palate can cause a partial breathing obstruction. Likewise, your neck muscles also relax and make your throat soft tissues to be closer together. Normally, when relaxed, soft throat tissues and the uvula touch. When air pushes through it, the tissues vibrate. These vibrating tissues cause the snoring sound that we hear. Zyppah positions the lower jaw forward and keeps the tongue stationary so the uvula and soft palate don’t collapse into the throat – which ultimately means no tissues touching, no vibrations, no snoring. Zyppah was designed by Dr. Jonathan Greenburg, one of the foremost authorities on treating snoring and sleep apnea. He has extensive experience in the field of dentistry before shifting his focus to treat snoring issues and open five different Sleep No More Centers across Southern California. Dr. Greenburg also has a background in bio-engineering that helped him create the revolutionary design of Zyppah. He discovered that he could eliminate snoring by addressing the airway blockage caused by a relaxed tongue and designed the Zyppah to address this specifically. This wide-ranging experience and knowledge in the fields of dentistry and bio-engineering guarantees that the product’s overall design is well researched and crafted by experts. Zyppah is a product designed and manufactured in the US where there are strict policies on medical devices. It complies with the US FDA standards as an anti-snoring device. Having passed through a stringent screening process assures that the product is of the highest standard and quality. Dr. Greenburg – Eliminating Snoring from ZYPPAH on Vimeo. How is Zyppah Snoring Aid different? There a lot of other MADs and TRDs on the market, what makes Zyppah different? It’s a two-in-one product. You get the necessary jaw and tongue support needed to clear airways and prevent snoring. The unique tongue strap – you stop snoring by addressing the root cause, the tongue. It works as a seatbelt for your tongue and prevents it from blocking airways. This is the only device on the market that offers this solution today. Zyppah offers a 90-day trial promotion. If not satisfied with the product, you can return it within 90 days and get a full refund. You get an additional 90 days if you purchase your Zyppah with their SNAP cleanser. The design and material used is vibrant, visually pleasing, comfortable to use and non-irritating. Customer reviews proclaim and support Zyppah’s claim to make sleeping, for you and your partner, silent and happy. Snoring was gone on their first try! Most customers are skeptical to use Zyppah because of how it is designed. Some comment that they have initial reservations to use it because of the tongue strap it has. In their minds, this strap may cause a gag reflex when used. Ordering the product was easy. Check their official website and place an order online. It was first released for over $120 but the prices have come down since and is now less than that. The company even offers further discounts when you purchase two Zyppahs instead of 1. Shipping, processing and handling fees are charged at a flat rate. Delivery is without hassle and on-time. The package and product are both attractive and the fitting instruction is straightforward and easy to follow. It uses a boil-and-bite method of preparation that’s common for MADs. After using it for a whole night, there was soreness in Casey’s jaws. This sensation was commonplace for MADs users. He continued to use it for more than a week and his mouth started to get used to it. Our original reservations on the tongue strap were relieved as Casey say’s it doesn’t feel uncomfortable at all! In time, the soreness gradually went away and with it the snoring! First and foremost, go see a physician to know the cause of your snoring issues. Only by knowing this can you find the most effective solution to rid yourself of this problem. Your mouth is unique and so are its problems, so learn more before you invest on a product that may or may not help you with your issues. Zyppah though, is a worriless investment. The unique design and positive customer feedback assures that you’re getting an effective and quality product. The 90-day money back guarantee gives you additional security that you’ll get fully refunded if you’re unhappy with it. So, see it for yourself, try it, risk-free! The ZQuiet mouthpiece is a Mandibular Advancement Device (MAD) created to reduce snoring. It is also designed to help reduce breathing problems during sleep like in sleep apnea. According to my research, this product is one of the top selling anti-snoring devices available in the market today. ZQuiet continues to gain popularity among people with snoring and sleep-related breathing problems. It stands now with a 9.8 rating among other products of its kind and considered as one of the best-selling MAD in the market. Who is ZQuiet Snoring Aid good for? Who should not use ZQuiet Snoring Aid? How is ZQuiet different from other Snoring Aids? Made of a soft medical grade, BPA-free, and latex-free material that’s non-irritating to use. Flexible due to its Living Hinge Technology feature and lets you move your mouth making speaking easy while wearing the device. Designated by the FDA as a class II medical device. Its airflow ports help you breathe while you sleep by keeping the mouth slightly opened for proper airflow. Cleanable with dish soap and a toothbrush. The product comes in a package of two mouthpieces to give you options when one does not work. No required fitting process as the material can be filed and trimmed if it’s too big. It’s price-worthy, comfortable and easy to use, durable, and effective. Not good if you wear it with loose or weak teeth and dentures. Its one-size-fits-all feature does not work as is because there’s no option if it’s too small, though it may be trimmed and filed if too big. One of its uncomfortable effects for first-timers or non-users is jaw soreness. Many customers who bought it pointed out its short lifespan before it needs replacement. ZQuiet is one for those who suffer from mild cases of obstructive sleep apnea or other snoring and breathing problems related to sleeping. This FDA-approved device helps people to have better and peaceful sleep at night, thus reducing daytime sleepiness. This product is best for those who are mouth breathers (people who usually breathe through their mouth when sleeping) or have stuffy nose so need to breathe through the mouth. The product is also good for anyone who needs it because it promotes a ‘one size fits all’ feature. However, if it does not fit snugly, it can be filed and trimmed if it’s too big. As I’ve stated in the pros and cons section of this article, ZQuiet is not recommended for those who wear dentures and with weak or loose teeth. It may be made of a flexible material but because of its built that fully covers the teeth area, it might not be good with dentures, loose, or weak teeth. If you have bridgeworks, braces or retainers, teeth crowns and the likes, you may want to reconsider other options like the customized ones. It’s still best to consult your dentist to be sure before using this product. ZQuiet features a hinged connection at the back or between the upper and lower parts. This Living Hinge Technology gives its flexibility for ease of movement and comfort. It comes in two mouthpieces per package for different choices and suitability of the user. One comes with the slight lower jaw advancement while the other has a farther or more advancement for holding the jaw forward. Unlike other MADs, ZQuiet is softer and more flexible with an FDA approval for its thermoplastic elastomer material. It is safe to use right away from its packaging and no pre-soaking is needed. It also features the airflow posts which ensure that the mouth does not close for continued breathing and non-blockage of the oral air passage. It’s good for users with nasal decongestion thus breathing orally. Its Living Hinge Technology gives it an extra advantage among other jaw retaining devices. The hinge at the back part of the mouthpiece connects and holds together the upper and lower jaws. This gives ZQuiet the flexibility that lets any user have that ease of jaw movement. It’s the first ever mouthpiece that possesses this kind of features. Sleeping Well LLC is ZQuiet’s manufacturer. Sleeping Well is a reputable company. It bears an A+ rating and accreditation from the Better Business Bureau. FDA designated ZQuiet as a class II medical device. The device has been put to the test and proven safe, effective, and convenient to use. Sleeping Well offers ZQuiet with a 30-day trial period for $9.95. Its full price is $89.90 (trial price included) plus the shipping fees. The full price will only be charged to your account after the 30-day trial period. If you chose to return the product before the trial period elapses, only the trial price and shipping fees are charged on you. You may have heard or read some problems related to ZQuiet but its manufacturer had seen to it that everything has been dealt with effectively. Based on studies and reviews, this product has proven its worth and effectiveness so far. ZQuiet differ from other devices or mouthpieces of its kind due to its Living Hinge Technology. Its softness and flexibility set it apart from other MADs. It no pre-soaking property makes it different also. You just need to literally “pop it in” as according to its ad. There’s no need for pre-soaking or “blanching” it with hot or warm water before its initial use. It also comes in two pieces with different lower jaw advancements for you to choose from. Size A has the slight lower jaw advancement while size B has a more advanced lower jar for a more distant jaw retaining hold. The device has also a ‘one size fits all’ feature. I don’t have any personal experience of the product but my friend’s cousin does. He’s a big guy who happens to have snoring and breathing problems during his sleep. ZQuiet has helped improve his breathing upon using it. His snoring was also noticeably reduced according to him. What he likes most about the product is that it’s so soft and flexible that he can talk and drink even when it’s still inside his mouth. He said that even if he felt a little awkward on first use, but the discomfort eventually subsides the next day when he already got used to the device. ZQuiet literally lives up to its slogan of just “pop it in” because he didn’t have to soak it with anything before using for the first time. All he did was to wear it right away after opening and taking it out of its packaging. He used the mouthpiece with the slight advancement at first and it served him well. He switched to the one with a more advanced lower jaw later on as he discovered that it suits him perfectly. It truly helped reduce his snoring and improve his sleeping patterns. Based on all the facts presented, ZQuiet earns a fair share of popularity and quality. The device poses fairly in comfort, style, and quality from among the other leading anti-snore mouthpieces in the market. This product passes every possible test that any mandibular advancement splint or device should withstand. It stands out among the others of its kind, and it’s truly effective. 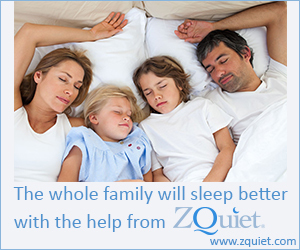 ZQuiet is proven and tested to live up to its reputation and credibility as a snoring solution. Try it now to find out how good it is and if it truly suits your preferences.